The Ashikaga shogunate, Japanese Ashikaga bakufu (1336 – 1573), was a feudal samurai government ruled by the shoguns of the Ashikaga family. Shoguns were de facto rulers of Japan although the authority of the Emperor was nominally acknolwedged. He was kept in imperial isolation as a distant but revered figure while governance devolved to the military dynasties. This period is also known as the Muromachi period and gets its name from the Muromachi area of Kyoto where the third shogun Yoshimitsu established his residence. Local nobles, the daimyo, also exercised considerable power and the Shogun could only rule with the co-operation and support of these men. Consequently, much skill was required and the Shogun was forced to consider the regional nobles' interests as well as his own. The Shogunate began by re-opening contact and commerce with China and ended with the first contact with Europeans, including Christian missionaries. 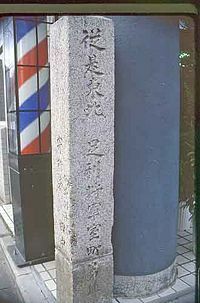 Marker for Site of Muromachi Bakufu, Kyoto. In part because the founder of the Ashikaga shogunate, Ashikaga Takauji, did so by siding with the Emperor against the previous Kamakura shogunate, the Ashikagas shared more of the governmental authority with the Imperial government than the Kamakura had. Thus, it was the weakest shogunate when compared with the Kamakura shogunate and the Tokugawa shogunate. However, most of the regional power still remained with the provincial daimyo, and the military power of the shogunate depended largely on their loyalty to the Ashikaga. As the daimyo increasingly feuded among themselves in the pursuit of power, that loyalty grew increasingly strained, until it erupted into open warfare in the late Muromachi period, also known as the Sengoku Period. Ahikaga Takauji re-opened trade with China and commissioned the Silver Pavilion (Ginkaku-ji). The Onin Wars (1467-1477) between various daimyo's resulted in political fragmentation. As the daimyos' power increased, they supported alternative candidates for the imperial succession, further complicating the already complex situation so that the Shogun's power became as nominal as that of their declared Emperor, who did not attract universal recognition. The samurai code of ethics (bushido or "way of the bushi") was the dominant philosophy, emphasizing military values. The Ashikaga shogunate was destroyed in 1573 when Oda Nobunaga drove the fifteenth and last Ashikaga shogun Ashikaga Yoshiaki out of Kyoto. Afterwards, Yoshiaki sought and received protection from the Mori clan in western Japan and later was requested by Toyotomi Hideyoshi to accept him as an adopted son and sixteenth Ashikaga Shogun but Yoshiaki refused. The Ashikaga family still survives to this day. Towards the end of this shogunate, the number of smaller daimyo had increased due to political fragmentation. By 1543, the first Europeans (Portuguese) had arrived in Japan intent on trade. Fire arms were introduced to Japan at this time. During the fifteenth and sixteenth centuries, some daimyo (warlord) states were well run. Cultural refinements and artistic expression were encouraged. Zen Buddhism, stressing simplicity and discipline, influenced the development of distinctive Zen arts of graceful gesture, elaborate ritual, composure and contemplation—such as gardens, architecture, and the tea ceremony. Sado (also known as chado or cha no yu) the traditional Japanese tea ceremony, which was popular with the first Ashikaga Shogun, was brought to perfection by Sen-no-Rikyu (1521-1591) in the sixteenth century. He incorporated the aesthetic values of wabi (subtle taste, a way of being calm and clear) and sabi (elegant simplicity) with ichigo ichie (the concept that every single encounter never repeats in a lifetime). Special powdered tea prepared with deep sincerity and hospitality in subtly shaped tea pots and cups, and drunk ritualistically with guests in attitudes of composure and contemplation, free of worldly concerns, seeking beauty that is one with nature. During the Ashikaga shogunate, despite considerable unrest due to the local power of the nobles, Zen Buddhism, no theatre and Chinese-style painting (sumi-e) flourished in Japan. Buddhism and Shintoism meshed together in this period. In 1549, Francis Xavier (1506–1552) the Jesuit missionary arrived in Japan and started to establish a Christian foothold. Landscape gardening, the tea ceremony, comedy, flowering arranging and other cultural activities were all popular. While rivalry between daimyo's became more violent with the introduction of fire arms towards the end of the Ashigaka period, culture helped to unite the Japanese people and increased trade resulted in greater prosperity. Art and culture especially flourished during the reign of the eighth Shogun. Keene (2003) shows how Ashikaga Yoshimasa reigned on the one hand over an artistic renaissance while on the other he almost single-handedly ended the effective power of the Shogun. He drained the treasury to fund his interest in blending perfumes. Inept as a military leader, he devoted his time to cultural pursuits and eventually abdicated to become a Buddhist monk. His wife left him because she thought he was too weak and one of his own concubines had an affair with his son. Yet, says Keene, the cultural legacy of his reign continues to influence Japanese art and architecture today. Much of this art and architecture concerned maintaining harmony between the built and the natural environment. This page was last modified on 3 April 2008, at 17:54.